Netflix Horror Spotlight brings you Wicked Horror‘s top picks for what to watch on Netflix, whether it’s the latest indie darling, a classic masterpiece or a silly slasher that deserves a little bit more attention. In this installment, Joey Keogh urges you to catch David Fincher’s masterful Zodiac before it expires. Netflix has just released their devastating, soon-to-be-expired list of movies and TV shows that will disappear from the service at the start of next month, never to be heard from again (er, until the next contract is agreed upon). A quick scan reveals nothing too devastating, other than the thoughtless removal of Jem and the Holograms and one key flick that you simply must watch immediately, if not sooner, regardless of whether you have seen it before. David Fincher’s Zodiac, the only account of the infamous murders that rocked San Francisco in the seventies worth checking out, is not just the definitive, and most entertaining, take on one of the most notorious (and still unsolved) murder mysteries in history, it’s also one of the most frightening flicks of the past ten years–even though most people wouldn’t consider it a horror film. A slow-burning, painfully tense thriller, it gradually establishes its central ideas in the reality of the everyday work-life, pitching Jake Gyllenhaal’s try-hard cartoonist against Mark Ruffalo’s stressed cop and Robert Downey Jnr.’s eccentric journo as they try and fail, over the course of several years, to figure out the identity of the titular killer. The drama is punctuated by well-orchestrated jump scares and short, brutal slices of bloody violence. This is classic Fincher, best exemplified in the brilliant Se7en which, in spite of being horrifying, was tame in terms of gore. I’m a big champion of the “less is more” philosophy because, when it comes to horror, often what is scarcely seen is scarier than what is, and that is hugely evident here. Our imaginations conjure up what could never possibly be expressed through film, and it is this idea that makes the best genre pieces truly terrifying. This is true of Halloween, The Silence Of The Lambs, even The Texas Chain Saw Massacre – a film that hinted at something horrible for most of its running time, before giving us just enough of a glimpse of it to allow us to fill in the blanks ourselves. Zodiac is not just a masterclass in film-making and storytelling, it’s proof that a horror movie does not have to be showy to be scary, and that sometimes the most terrifying stories are the truest, the quietest, the ones told with the least fuss, where the Devil truly is in the details and nobody is really safe. The film is based on a rather good book by cartoonist Robert Graysmith (portrayed by Gyllenhaal in the film), who became obsessed with the case while working at the San Francisco Chronicle, and revolves around a serial killer known only as Zodiac, who terrorised Calfornia in the late sixties and early seventies. Detailed over a bum-numbing two and half hour plus run-time, the tension is built so effectively that, when the true horror reveals itself, it’s so disarming that it almost makes you turn away in disgust, despite the fact that, besides a fairly brutal stabbing scene (that will stay with me for the rest of my life) most of the violence is implied, rather than shown. The long running time is made a hell of a lot easier by the three leads, all of whom bring energy, vitality and likeability to their roles as their differing personalities play off one another. Ruffalo is the wearied, frustrated cop, tired of investigating the case, Robert Downey Jr, the eccentric, alcoholic journalist covering it, and Jake Gyllenhaal the quiet, nerdy cartoonist who becomes obsessed with it and can’t let go, even after the others have. Although it doesn’t sound like thriller material, we spend much of the film on the edge of our seats as these three, totally opposite men struggle to fit the pieces of the puzzle together, all the while at the mercy of a brilliant, psychopathic mastermind whose identity remains a mystery to this day (though the most popular theory as to the killer’s true identity is explored in the film). 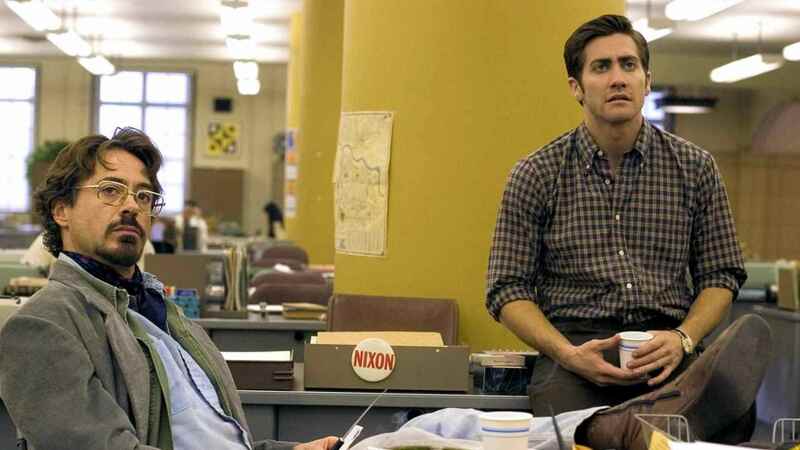 Zodiac is an absolute masterclass in building tension, especially when Gyllenhaal is left to work the case alone and finds himself not only stalked by the sinister Zodiac, but gets into some seriously dodgy situations involving the various suspects, as well. What could’ve been anticlimactic actually turns out much more horrifying, as Gyllenhaal’s Graysmith unravels under the weight of not knowing. He sacrifices everything and, as the events of the film take place over several years, the effects of the case on everyone else are shown too, from the journalists, to the cops–all of whom wanted to solve it and finally be safe but couldn’t, and later find it incredibly difficult to live with the reality of not knowing. It’s a truly terrifying scenario, made even more so by the fact that it’s a true story and the Zodiac, essentially, got away with murder. I could go on for another ten paragraphs about how much I love Zodiac and why you should see it immediately, but suffice to say it is one of the most effective horror films of the noughties–terrifying, involving, very well-acted, gorgeous to look at and its running time flies by. The three leads are excellent, the villain, though technically masked, is frightening, and the story itself is both captivating and horrifying. It’s not very often that “true life” films are done this well, and as a horror movie, Zodiac more than succeeds. A must-watch for horror obsessives, even if it’s not technically classified as a genre piece, catch it now on Netflix before it disappears February 1st.